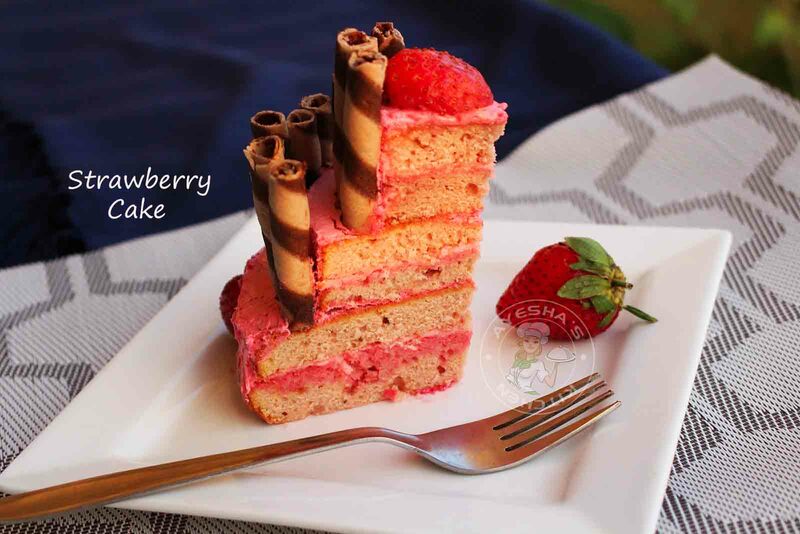 Here is an easy and simple strawberry cake recipe to enlighten your loved ones birthday or any special occasions. This is my first attempt on three tiered cakes, which i made for my daughter on her birthday. January 2nd, my little naughty babe is now three years old!!!! The best part of being a mother is enjoying that beautiful smile of our little ones, which can be achieved by preparing their favorite dishes every day. Strawberry is my kids favorite fruit and they love anything made of strawberry. So i just thought of making a special strawberry cake for them. As it is her third birthday, just for a change i thought of making this wonderful treat as a surprise. That really works . My mind was full of queries regarding the whole process of tiered cakes. Since this is my first tiered cake / stack cake recipe, i enjoyed the whole process resignedly. Here is the recipe showing how to make stack cake / 2 tier cake / recipes for strawberries /strawberry birthday cake. Preheat the oven to 180 degree C. Grease the pan with butter and dust with flour and tap out the excess flour. Set aside. OR after greasing the pan line the bottom and sides with butter paper. This avoids sticking the cake to the bottom of the pan. Sift together All purpose flour, baking soda, baking powder. Set it aside. Now lets start....add the eggs in a bowl, whisk it. Then add strawberry puree (chop 6 strawberries and grind it without adding water). Whisk well. Then add, vanilla essence and pink food color (optional). Whisk it. Now fold in the sifted flour mixture little by little and fold them well. Do not use the whisker. Finally add the strawberry jam paste (add the jam in the grinder and make paste without adding water). Mix well using spatula. I made two cakes. One medium sized cake and one small sized cake. Now lets start. Add whipping powder in the chilled bowl. To this add cold milk little by little .Whisk with an electric whiskers until soft peaks are formed( it will take around 3 minutes). Whisk over a high speed, off the whisker. Again whisk over a medium speed, off the whisker. Like so, repeat until soft stiff peaks are formed. Finally add few drops of pink food color and whisk. 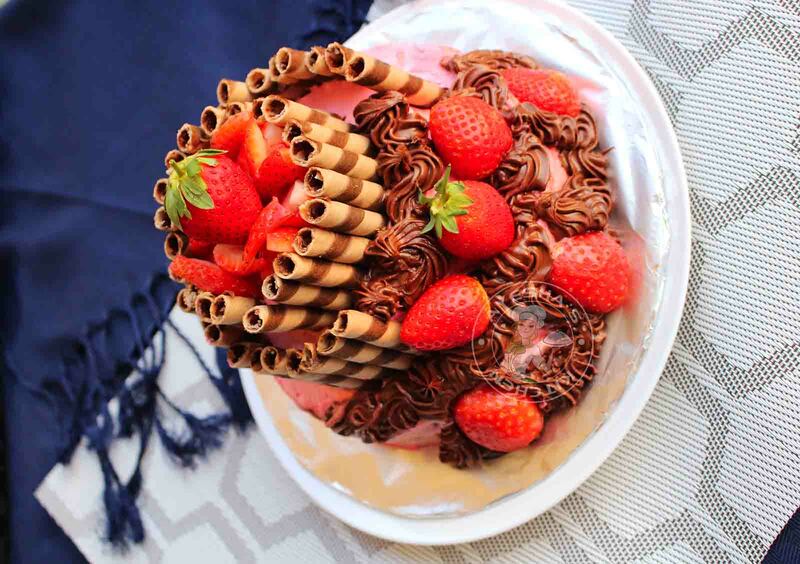 Make designs with nutella using piping bag. 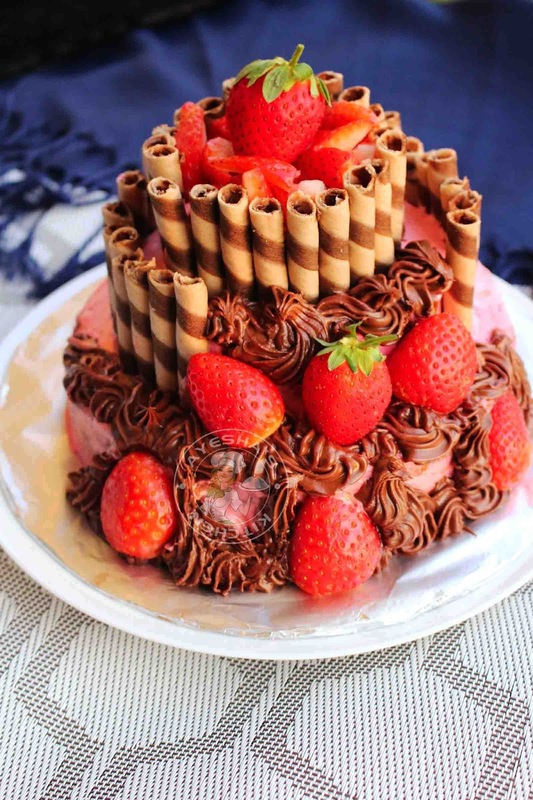 Decorate with wafer sticks and fresh strawberries. Here i made two cakes. And for the third cake, i sliced the top of those cakes and made the third cake layers with that slice using a round cookie cutter or any lid. For spreading between layers, i used a creamy whipped cream which gives the cake more moist. Frost each cakes separately and then top one over the other.